The Senator is a large elegant design with maximum pool area. 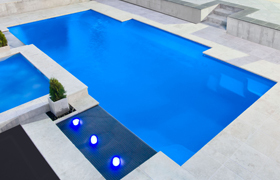 This pool features dual entry and resting ledges, allowing plenty of space for swimming laps and keeping fit. With clean lines and contemporary style the Senator is a sophisticated addition to any modern home.